Of the dead futon it can be said that it lies slumped like no other discard. It is the most bodily of laneway deaths, short of finding an actual body. When the time comes and I’m lying in the gutter breathing my last as Life’s Great Garbage Truck rumbles towards me, this is how I will feel. Like a futon. A futon is a huge slab of decaying meat. It embodies the flip side of all that is billed as natural or organic, namely decay and decomposition. 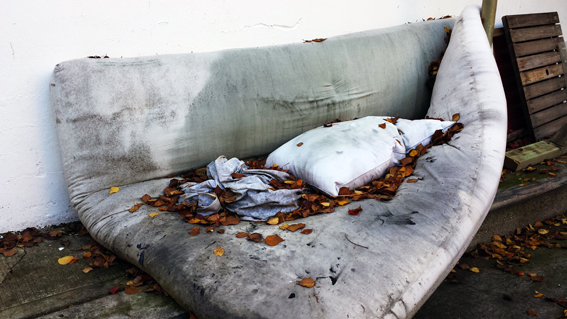 Rotting, mouldy, the dark stains of putrescence spreading like pestilence, the futon is like a beached carcass – vast, immovable. Pure dead weight. The bodily comparisons are appropriate because the futon, more than most other deaths, has a close physical relationship with us. Most deaths are distant, almost abstract; we flick a switch to turn them on, keep them at arm’s-length, call on them only intermittently as required. The futon though is a constant, supportive presence; it responds to our corporeality, moulds itself according to our bodily mass, the yin to our yang. With a futon, it is personal – as well as shifting, mutable, almost a living thing. The futon grows with us. For many people, the futon is their first bed, the one they actually own themselves after leaving home, carted around from one shared house to another, the site where new relationships are explored, boundaries dissolved, horizons expanded. Sharing a futon is not like sharing a mattress; it carries a symbolic, significant weight, so to speak. People can bond – and fall out – over a futon in a way that is just not possible with a mere mattress. And yet, almost inevitably, a time comes when the futon must be put aside for more worldly matters – or mattresses. The shift from futon to mattress represents a coming-of-age – and I acknowledge that not everybody experiences this transition – that usually accompanies the process of ‘settling-down’. The trusty futon is cast off and a road-tested, reliable mattress takes its place; the individual is subsumed by the mass-produced. The futon becomes Falstaff, albeit less dissolute and unreliable, but nevertheless rejected and disowned: “I know thee not, old man”. There is no comeback for an old futon, no second chances; repudiation is final and absolute, like a body double left behind when the role we are playing moves on.